Since 1934, the Federal Housing Administration (FHA) has played a vital role in the housing finance system. It serves as the entry point to the mortgage market for many first-time homebuyers and helped create a strong economic recovery following the Great Depression. However, in its early development, the FHA perpetuated racial discrimination in its facilitation of broad mortgage credit liquidity by favoring white borrowers and excluding African-Americans and other people of color. This discrimination is a key contributor to the differing rates of homeownership between whites and people of color today, as well as a contributor to the persistent racial wealth gap. The federal government never accounted for its role in fostering housing discrimination and must do so. Still, FHA remains crucial to the mortgage market for the countercyclical role it offers in sustaining the system, and it continues to ensure access for underserved borrowers. 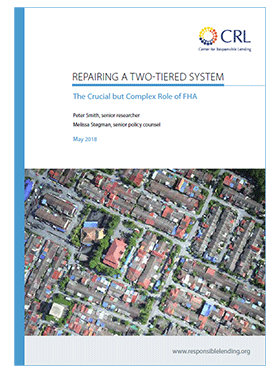 FHA is a significant tool to increase affordable homeownership, but policymakers must address and guard against policies that perpetuate a two-tiered mortgage financing system. By examining 2004–2016 mortgage origination data and market participation among banks and non- depositories, this report examines FHA lending before and after the financial crisis to better understand how the FHA program currently supports homeownership—particularly homeownership among borrowers of color. This report also evaluates FHA pricing and recent enforcement actions related to the False Claims Act (FCA) that have limited the effectiveness of the program in meeting its homeownership goals. FHA supported the conventional purchase market during the most recent economic recession when private actors retreated, but post-recession the program continues to hold a substantial market share. In 2004, over 400,000 FHA loans were originated, making up 8.8% of the mortgage market. By 2009 this percentage had increased to 42% of the market, and in years since it has remained high, at just over a quarter of the market. FHA purchase market share among lower-income borrowers increases, but not as fast as among higher-income borrowers. After the recession, high-income borrowers experienced a more than 400% increase in FHA market share. In comparison, low-, moderate-, and middle-income borrowers grew 116%, 132%, and 200%, respectively, between 2004 and 2016. FHA purchase lending among borrowers of color remains persistently high, including for higher-income African-Americans, as compared to conventional lending. FHA market share for Black and Latino borrowers now approaches half of all purchase mortgage lending to these borrowers. Additionally, FHA market share jumped 180% from 2004 levels for low-income Black borrowers and 267% and 642% from 2004 levels for Black middle-income and high-income borrowers, respectively. Borrowers of color, low- to moderate-income families, and lower-wealth families lack access to conventional mortgages. Excessive risk-based pricing prevents many borrowers from accessing the conventional market, as the cost of credit is prohibitive. The combination of loan-level price adjustments (LLPAs) and mortgage insurance (MI) premiums adds over 300 basis points to the cost of a mortgage for a borrower with a credit score of 620 and a loan-to-value ratio (LTV) of 97%. Because of tight and expensive credit in the conventional market, many borrowers of color, low- to moderate-income families, and lower-wealth families are left with FHA as their only option. Pricing barriers in the FHA market include mortgage insurance premiums—particularly the life of loan premium—and lender overlays on FHA loans. Since 2004, many large banks making FHA loans have reduced their FHA purchase lending footprint, while nonbanks have helped fill the gap. Of the top 10 FHA home purchase lenders in 2004, five were depositories and five were non-depositories; by 2016, eight of the top 10 FHA lenders were non-depositories. Newer market entrants make up a substantial part of the top 10 lenders, with at least four of the top 10 2016 FHA home purchase lenders beginning operation since 2007. FCA enforcement and legal uncertainty have been a principal driver of large banks exiting the FHA market and imposing stringent credit overlays on FHA loans.